Log in or Open a free account here. As a follow up to Sonic Reality's Neil Peart Drums Vol. 1 The Kit, Neil Peart Drums Vol. 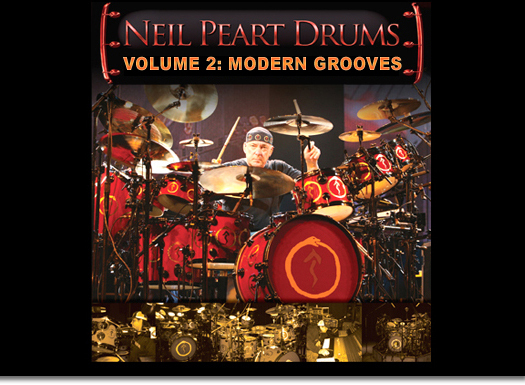 2 Modern Grooves (formerly called "The Grooves") features Rex, Apple Loops and Wave drum grooves performed by Neil Peart, the legendary drummer of the band Rush, which were recorded by producer Nick Raskulinecz (Rush, Foo Fighters, Alice In Chains). This title focuses on the hard rock grooves of Rush in the style of songs from Rush's "Roll The Bones" album up through "Snakes and Arrows". Over 500 groove patterns to work with in any combination with flexible tempos so they can fit into any style of music you re working on. It's like having Neil Peart play drums on your songs! Neil Peart Drums R.A.W. Artist Pack is the ultimate collection of album quality stereo mixed drums for your music! "Featuring Neil Peart Drums by Sonic Reality" An example that would not be okay is "Drums by Neil Peart". You can alternatively not credit the drums at all. But if you want to use Neil Peart's name it must be "Neil Peart Drums by Sonic Reality". If you have any questions you can contact support (at) sonicreality (dot) com. Acidized Wave - Acidized Wave format files for use directly in Live, Acid, FL Studio or any other Wave compatible DAW or sampler. Copyright © 2006-2019 Sonic Reality - All Rights Reserved.